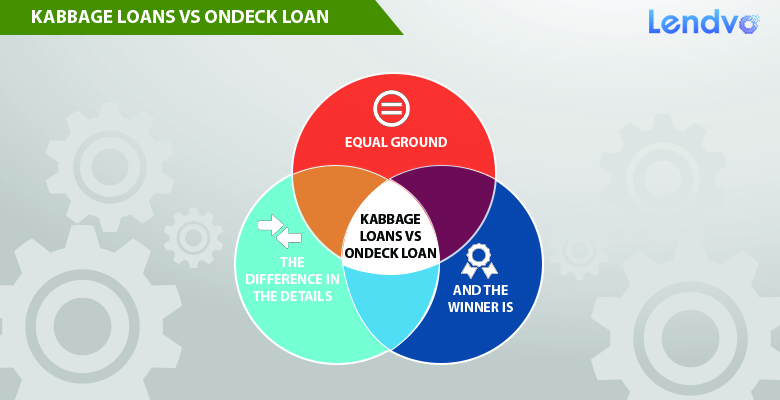 Kabbage and Ondeck are direct competitors in the alternative business loan arena. Each provide loans to small businesses when capital requirements are urgent and often when the credit of the business is questionable or bad. And each offer the promise of speed and simplicity in obtaining a loan quickly. But while their ability to provide a borrower with cash is comparable. How do they compare in a head to head matchup? In a discussion of how the two lenders compare it is best to first determine how they are closest to equal. Application Process: Both Ondeck and Kabbage have a simple, internet based application fee. In both cases the application can be completed in about ten minutes. Once approved, both lenders will make funds available within 1 to 3 business days. Collateral Requirements and Guarantees: Both Kabbage and Ondeck are equal in terms of requiring a personal guarantee. This means that you are committing to personally repaying the loan. For collateral neither Kabbage nor Ondeck require collateral, however they will both place a UCC lien on your business assets and property (Ondeck places the lien for all loans and Kabbage does so for loans above $20,000). Customer Service: Both Kabbage and Ondeck have aggressively pursued strong customer service to back up their business. Reviews and general opinion are that despite any other feelings consumers may have their customer service efforts are generally well received and acknowledged. Both have phone, online chat and live assistance available and both have A+ ratings with the Better Business Bureau. While subtle differences may exist their customer service levels seem on par with one another. Now that we have discussed where they are similar or equal, let’s look at where they are different. Loan requirements: Both lenders have requirements about annual revenues, how long the business has been in business and the minimum credit score they require. However, the requirements do differ and could drastically affect your decision on who to use when applying for a loan. Kabbage requires a minimum credit score of 550 with at least one year in business and revenues of at least $50,000 (or $,200 per month for the last three months. Ondeck requires a credit score of only 500 and requires at least one year of operation. However, Ondeck’s revenue requirements are $100,000 per year. Every borrower has different needs. And in the alternative lending world those needs will dictate the best path for each business. Overall business conditions, individual credit health and many other factors must be considered when selecting a lender. But it isn’t as simple as a winner and a loser. More often, it is what is the winning circumstances and terms for that borrower at that point in time. The comparisons above can help you make the best decision possible for those circumstances.